TS POLYCET is abbreviated as Telangana State Polytechnic Common Entrance Test is a state level entrance exam for the candidates belonging to Telangana state. 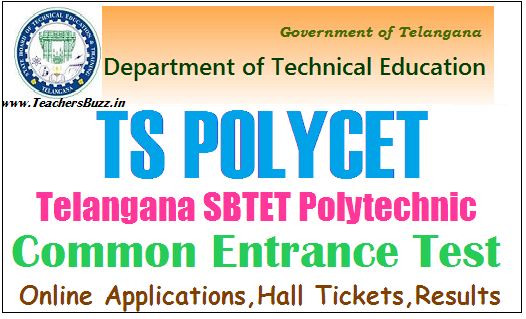 Telangana State Board of Technical Education & Training Telangana (TS SBTET) has released Polytechnic Common Entrance Test (POLYCET-2019) Notification for the candidates seeking admission in to all Diploma Courses in Engineering / Non Engineering/ Technology offered at Polytechnics / institutions (including Aided and Unaided Private Polytechnics / Institutions running as 2nd shift in Pvt. Engineering Colleges) in Telangana State for the academic year 2019-2020. The State Board of Technical Education and Training(SBET), Telangana, Hyderabad invites online applications from the eligible candidates for admission into above mentioned courses from 14-03-2019 to 04-04-2019. The Telangna State POLYCET 2019 would be conducted on 16th April 2019. The test results would be announced on May-2019 . The Classes would be started from June 9. The Department is mulling to revamp the syllabus of various subjects, keeping in view the industrial requirements, which will be implemented from the this academic year. 1. Candidates should have passed (or) its equivalent and recognized by the Board of Secondary Education in TS,Hyderabad are eligible. 2. The candidates who have compartmentally passed (or) appearing for SSC are also eligible to apply. 3. They must have passed in all subjects before seeking admission. Candidates belonging to NIOS/ TOSS/ APOSS/ CBSE/ ICSE/ OTHER Examinations recognized as equivalent to SSC by Telangana State should have passed all the subjects including Mathematics, Physics, Chemistry, with minimum of 35% Marks in each subject. Interested candidates can register for TS POLYCET 2019 Notification through Online Mode from 14th March, 2019. The detailed list of these centres is available at http://sbtet.telangana.gov.in website. In order to file application through these centers a filing fee of Rs.330/- (Rupees Three hundred and thirty only) (Excluding Application Cost) has to be paid to the operator by the candidate.